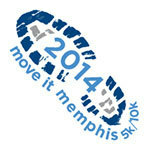 Details:Join us for the 4th Annual “Move It Memphis 10K & 5K” hosted by the Memphis Regional Chamber. This will be a new Downtown Memphis Course with a post race party you will not want to miss. Registration open now.